SpaceCheap.com's Network Operations Center resides in Houston, Texas. Our network has such state of the art features as fiber optic networking, OC3 connections, bandwidth on demand ability, redundant UPS systems, generator backup, VESPA detection systems, closed circuit monitoring of all areas and entrances, card key access, 24 hour guard manned security, redundant a/c systems, and fiber from 5 separate providers. (see below). 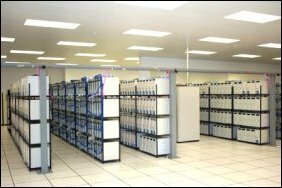 SpaceCheap.com recognizes that down time is not an option for your servers... a substantial investment in hardware and facilities ensures you are up and running on the web 24 hours a day, seven days a week. 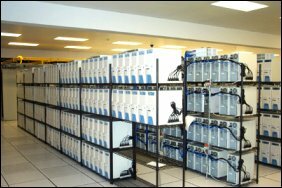 To guard against local power failures, our servers utilize two industrial-grade, three phase Liebert UPS systems. These act as back-up batteries, maintaining uninterrupted power in case of surges or power outages. With these backup systems in place, we can keep our network up and running indefinitely without relying on external power. All web servers are equipped with a positive pressure filtered-air system. Four large fans pull filtered air into each server's protective case and the components within are cooled by fans which circulate this purified air. This constant introduction of clean air into the case creates a positive pressure environment ensuring dust and particles remain outside of the server. The drives and drive bays of all servers are constructed from high-grade aluminum, and rest in shock mounted drive cages, which adds to the durability of the hardware. Our drives proudly feature the lowest failure rate in the industry. Each server employs dual-redundant hot swap power supplies. If a power supply were to fail, the server would continue running with power from the alternate supply. Meanwhile, alarms would alert a technician, who would quickly restore redundancy. In the meantime, servers and client sites would experience no downtime. SpaceCheap.com's NOC has two Liebert ten ton industrial air conditioners, which condition our computer rooms and operations center. Our computer room is kept at an optimal temperature of 65 degrees fahrenheit. We keep spare servers on-line of all CPU configurations. If a server were to experience a hardware failure, we would turn a key, grab the handle on the drive, pull it out, and insert it into an identical standby CPU. We would then reboot the second machine and the server would be up and running again in a matter of minutes. Time Warner GB Link to Internet 1000Mbps Max. Verio Gigabit Ethernet to Internet 1000Mbps Max. Savvis OC3 Link to Internet 155Mbps Max. ELI DS3 Link to Internet 45Mbps Max. Cogent GB Link to Internet 1000Mbps Max. Utilization of intelligent end-user routing software called Border Gateway Protocol (BGP), between Qwest, GC and GTE, who use the same protocol. BGP identifies which path is the most efficient for each data packet and then routes the packet to its destination on the fastest path. This increases the speed at which web pages sent from our NOC arrive at their destination. Too often providers operate their networks at three to four times responsible capacity. As a result, their corresponding transfer times reach over 300ms. spacecheap.com's network daily average is 27% of its capacity, with midday peak spikes reaching only 33% capacity. spacecheap.com guarantees you will be carried off our network in less than 80ms over a five minute average at any time of day or night. Copyright© 2002 spacecheap.com. All rights reserved.